Sanchez Energygrew production to to 11,774 boe/d in the third quarter. That's more than 50% growth since the second quarter. Even more impressively, the company has grown production 710% since the third quarter of 2012. Don't expect production growth to slow in the fourth quarter. The company has six rigs running, 19 wells in various stages of completion, and expects production of 15,000-17,000 boe/d in the final quarter of the year. Strong growth at the end of 2013 will set the company up well for 2014. Sanchez now expects to double 2013 production with a 2014 exit rate of of 22,000-26,000 boe/d. Sanchez Energy is an Eagle Ford focused operator with more than 140,000 net acres in the play and a drilling inventory of more than 1,700 wells. 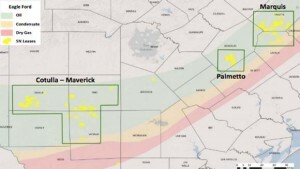 The company did venture out of the Eagle Ford with a recent acquisition of 40,000 net acres targeting the Tuscaloosa Marine Shale (TMS). The TMS is an Eagle Ford equivalent formation found in Louisiana and Mississippi.